The I Ching is an ancient oracle that is still relevant and useful today. Consulting it is like asking a friend or mentor for their thoughts on your problem or situation. Anyone can consult the I Ching for themselves or for someone else who needs help or advice about any subject. I hope you can join us tomorrow evening for a hands-on workshop on using the I Ching. Jung used the I Ching with patients as one method of using synchronistic principles to access intuitive knowledge. Bring your coins, dice, copies of the I Ching if you have them. This will be a practical introduction by FOJ member, Mike Hurn. Location: 20 Cleary Avenue, Ottawa, Ontario. This is a test to see if this also gets posted to Facebook. Workshop and Practice with the I Ching, guided by Mike and Claire Hurn. Although co-authors of The I Ching: the book to turn to for Wisdom and Guidance, this couple’s presentation is about using the I Ching. 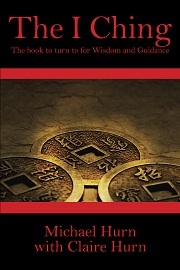 Hence you are encouraged to bring any copy of this Chinese oracle text you may have. My husband has been out of full-time work for almost 2 years and is searching for a career that will make a good income and uses his innate artistic skills. Trust our instincts and retreat to a safe place. No large actions or risk taking at this time. Stay away from draining and unkind people. my life has been going through a lot of changes recently and I am trying to make sense of what is actually happening to me. The first hexagram 010 (15) Seems to indicate that I need to be modest and realistic about my abilities and options in this situation. I must remain calm despite the storms raging around me. If Im quiet and determined in my chosen course of action there will be great good fortune. My changing line – Be humble, have a good work ethic then people will want to be around me. 2nd hexagram: 000 (2) The solution to the problem may be unusual and creative. Take no action just now but seek the help and guidance of a leader or role model, work with like minded people. Then make plans for future activitiy when the time is right. How does what’s happening now bode/relate to my future? My life has been going through some major changes. Over Christmas I and my kids have been really ill with the flu, things have slowed down a lot and feel that I am in a holding pattern regards the changes that have been happening. I’m wondering how things are shaping up for the future. No changing lines, hence no second hexagram. It appears that not all is lost and I have cast a very lucky hexagram. Good fortune is achieved with virtually no effort (I like the sound of that!) Bad things are going away and good things are coming soon. There are no changing lines so it appears that my situation is stable for the moment. There will be help available. looks like the future is looking good. keep the faith and stay positive, things will get better.